Our unique take on the traditional Brazilian fudgy bonbon. (Yes, they speak Portuguese in Brazil, but Brigadieros are enjoyed throughout Spanish-speaking Latin America too!) 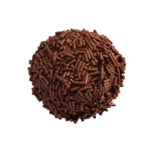 This super-rich truffle is made from aromatic Venezuelan dark chocolate, hand-rolled and coated with pure dark chocolate sprinkles for a delightful juxtaposition of flavors and textures. Although wine is produced in all 50 states, almost 90% of American wine comes from California, with Cabernet Sauvignon often considered the crown jewel. 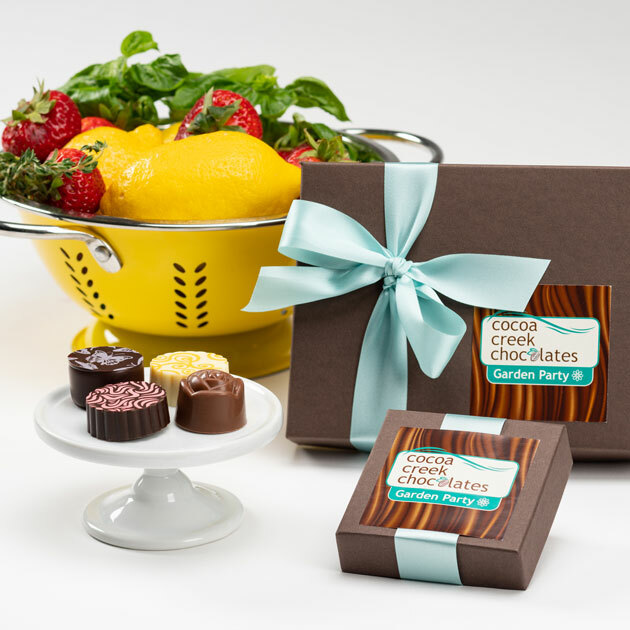 A full-bodied wine characterized by deeply fruity, savory and peppery flavors, cabernet is the perfect foil for our lush 70% dark chocolate ganache, while a sprinkle smoked sea salt complements the richness of this gorgeous truffle. 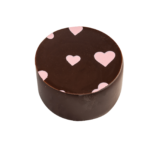 This celebratory truffle features a unique ganache made from a high-cocoa content (46%) French milk chocolate, perfectly balancing rich creaminess with the intensity and slightly bittersweet profile associated with dark chocolate. 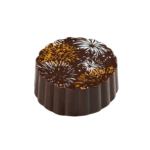 It is infused with French champagne and covered with a rich dark chocolate shell. Enjoy the fireworks! 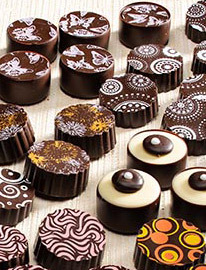 A deep chocolate ganache made from French Valrhona chocolate reveals a bitter flavor and aroma with notes of molasses and coffee. 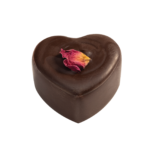 Covered with another layer of rich dark chocolate and decorated with a delicate organic dried rose petal, this truffle is an elegant statement of l’amour. An Italian liqueur made from the celebrated lemons grown along the Amalfi Coast, Limoncello tastes like a mouthful of sunshine. 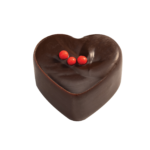 Combined with fresh basil, it adds a bright Mediterranean twist to our creamy white chocolate ganache, which is tucked inside a luscious dark chocolate heart. Bellissima! Passion fruit mousse is one of South America’s most popular desserts and the inspiration for this exquisite truffle. 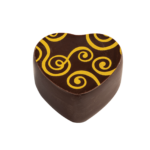 Our creamy white chocolate ganache is flavored with sparkling passion fruit wine and lovingly ensconced in a dark chocolate heart-shaped shell. It’s passion at its most delicious! It’s the all-American childhood comfort food that we never outgrow! Nothing says love like peanut butter and chocolate, and this yummy, nostalgic truffle takes those classic flavors to the next level. Premium Wilbur milk chocolate provides an impossible creaminess and decadence, proving that sometimes you really CAN improve on a classic. 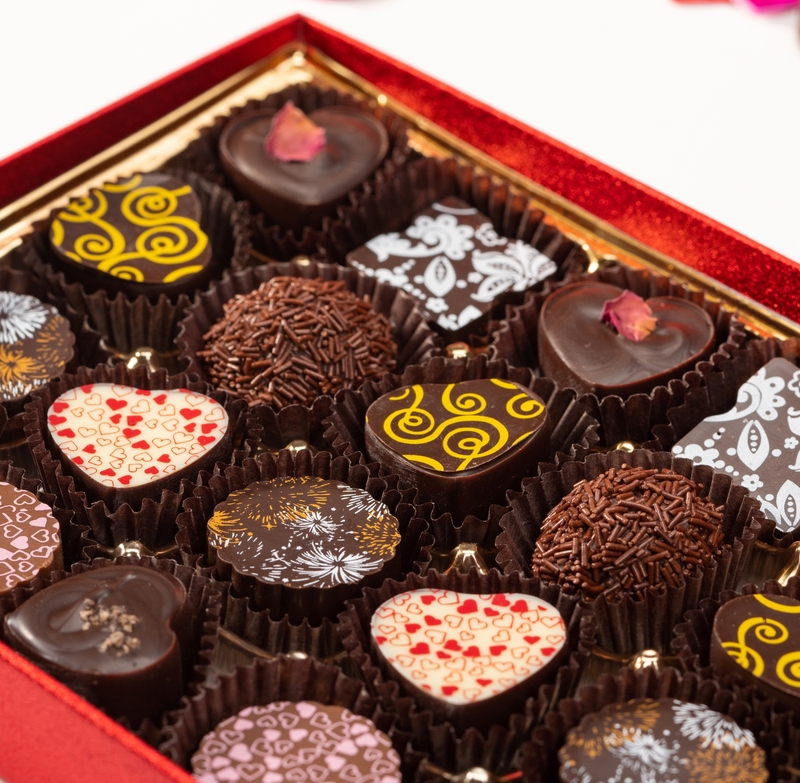 The renowned Italian bubbly wine provides extra sparkle to our Italian 78% extra-dark chocolate ganache. 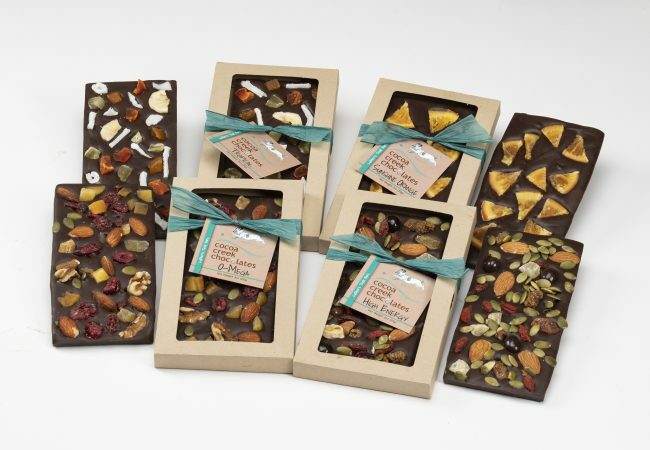 A slightly milder dark chocolate shell is a graceful counter-balance of flavor and texture. The perfect way to toast your amore. The mysterious, complicated hero of Casablanca, Rick is outwardly cynical and callous, but harbors a patriotic, idealistic and sentimental heart. 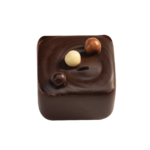 His Pear Sauternes Truffle features a white chocolate ganache flavored with pear and the French sweet wine, enrobed in French dark chocolate. Because, we’ll always have Paris. Loyal to her husband Victor yet passionately in love with Rick, Ilsa is an elegant, exotic and tragic figure. She has travelled from Oslo to Paris to Casablanca, hoping to continue to America, and she possesses an understated aura of international glamour. 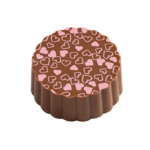 Her Amarula Cream Truffle has a French milk chocolate ganache flavored with Amarula Cream Liqueur from Africa, covered with American milk chocolate. Rhett, a native of Charleston, is dashing, adventurous, scandalous and opportunistic. He sees a kindred spirit in Scarlett, but sadly she is too late in returning his love. 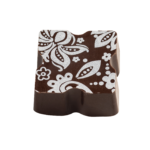 Rhett’s Bourbon Pecan Truffle features a dark chocolate ganache infused with the quintessential Southern whisky and chopped pecans, covered with dark chocolate. Scarlett, a fiercely determined, resilient, manipulative and spoiled Southern belle, was raised on a plantation in Clayton County, Georgia and later remakes her life in Atlanta. She is able to wrap men around her little finger… all except Rhett. 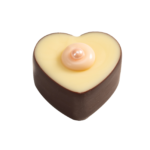 Hers is a Georgia Peach Truffle: a white chocolate-peach ganache in a dark chocolate heart-shaped shell. The handsome and charming Gatsby is known for throwing decadent, champagne-drenched parties. He would surely approve of our Champagne Truffle, featuring a ganache made from high-cocoa content (46%) French milk chocolate infused with champagne and covered with a rich dark chocolate shell. The object of Gatsby’s longing, Daisy is a “golden girl,” born into old money and status. This Golden Chocolate Truffle‘s ganache is made from a unique Belgian golden chocolate, encased in premium rich dark chocolate. 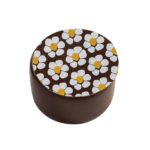 And it’s decorated with cocoa butter daisies, of course. Cool, suave, aloof, and wealthy Fitzwilliam Darcy of Pemberley is seen as a prime catch, and he knows it. He’s proud. He’s also the epitome of British sophistication. 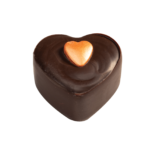 Our Mr. Darcy Truffle features a dark chocolate ganache made from bittersweet French Valrhona chocolate, covered with another layer of rich dark chocolate. 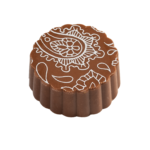 Decorated with a delicate organic dried rose petal, this truffle makes an elegant statement. Elizabeth Bennett is often considered one of the most complex and interesting heroines in all of British literature. Intelligent and headstrong, she has a tendency to judge people quickly, but is willing to change her mind when proven wrong. 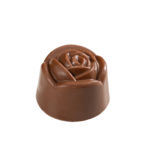 For this English Rose, we have a Rose Truffle: a distinctive milk chocolate ganache flavored with rose water, enrobed in a milk chocolate shell in the shape of a rosebud. Westley is courageous and steadfast in his love for Buttercup. “Death cannot stop true love,” he assures her. “All it can do is delay it for a while.” (sigh…) His Golden Chocolate Rum Truffle is a nod to his golden good looks and his pseudo-identity as the Dread Pirate Roberts; the ganache is made from a unique Belgian golden chocolate and flavored with a healthy dose of dark rum, then covered with another layer of rich dark chocolate. Although Buttercup’s relationship with Westley begins with her ordering him around, they fall desperately in love, and she braves a fire swamp, giant rodents, lightening sand and the vindictive Prince Humperdinck to be reunited with him. Her Buttercup Buttercream is made with freshest premium ingredients, including real butter (of course!) and pure vanilla, then covered with rich dark chocolate. As you wish. Shakespeare’s young Romeo is all impulse, intensity and passion — much like most teenagers. 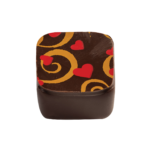 His beloved Juliet describes him as “whiter than new snow upon a raven’s back.” This Passion Fruit Truffle’s creamy white ganache is flavored with sparkling passion fruit wine and enveloped in a dark chocolate heart. Despite their pure passion and well-laid plans, the story of these young lovers was bound to end badly. Juliet meets her tragic demise when she plunges Romeo’s knife into her own chest. 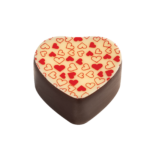 Our luscious Raspberry Truffle, with its Italian bittersweet dark chocolate-raspberry ganache and dark chocolate shell, is a much happier expression of love.